Club Penguin Cheats by Mimo777 Club Penguin Cheats by Mimo777: Screenhog's Fair Scavenger Hunt! Ok, yeah, that was pretty easy. What can you all think of that we could go looking for? Try other Virtual Worlds Now! Wow that was easy! wow mimo your fast at posting! Awesome! 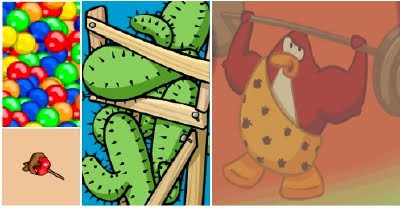 i can't wait to find these next time i go on clubpenguin. i think that moustache well be for the memebers. Sweet! Just came home from the boringest day at school! - Beach -The room between the game Puffle shuffle and the prizes. To Kingred9, maybe, maybe not. But I'm sure if the moustache is for members cp will add something for non-members too! Sweet!! Same here. Well actually it was cross country practice. I found 'em all Mimo! hey mimo, i was in the ski lodge, and i noticed that the fire in the ski lodge was just like the fire at the cove when ninjas were to expect a 'fiery' surprise. it becomes a giant fire for a split second. i swear i saw it with my own eyes. if you guys dont see it, then im sorry. It's a little easy lol. I got a new cheat for u, mimo! 3) Press the tab button on your keyboard, and a yellow box should come up on the exit button. 4) Press enter as many times as you can while it's loading, and look at your ticket amount after you play. Hey mimo! I just came back from the first day at my new middle school. All the girls are pretty rad! Here is my scavenger hunt list! Hopefully you can get this!Its pretty hard and it took me a while! im a big fan mimo! it is easy i found out what the series four toys are white puffles! Thanks for telling us but Mimo already posted about that. wow! hey mimo? can u do another mimo Q and A plz? yo mimo clubpenguin has new clubpenguin mix n match figures check it out. P.S. For all of you out there i go on the server Koscusko or watever its called! we could look for yarr wait where is yarr?yarr oh yarr.oh yeah hes with rockhopper and when you meet rockhopper he will go around and do all this stuff so if your a member when rockhopper gos to the great puffle circus you will see yarr preform. p.s.that means yarr will not be with rockhopper at all times. Wow I found them all! hey mimo guess what? i got the emerald in treasure hunt! yippee! did u notice the game puffle paddle doesn't have a white puffle? Hey mimo have you heard of the "Club Penguin Improvement project"? It is closed now but you never know when it will come back up. Yup! That's why he is the number one! You can only put "(CPG MOD)" after your name if you have answered a question or you have the privilige to be promoted. Yes, the moustache will be for members 100%! Hey Mimo, here's a cheat! Tomorrows 101 Days of Fun activity is Day 100; Find a pin made especially for 101 fans! Hint: Walk, waddle, or run to the place that the first 101 activity was done. The first 101 Days of Fun activity was Day 1: It's Time For The Epic Pin Hunt! Turn Blue, Put On Your Ice Cream Apron, & See If You Can Lead 25 Penguins To The Pin! The pin was the chocolate ice cream cone, at the forest. And think the chocolate ice cream cone is a emote, along wit h the Strawberry Ice Cream Cone! I think that the "special" pin is going to be a strawberry ice cream cone, and that it will be at the forest.! Good for U! I found them all too! It was easy. Thats cool! Thanks for telling CPG! PLEASE COME! This party will be awesome! Sooner or later he will plan an Q & A! Stay tuned for more awesome contests and post! -----------------------------------hmm.. guud job guyss! anyway who the heck is screenhog?? mimo doesn't post abt chobots... mimo throw a party soon.. and more clues n contests. hey mimo! this has nothing to do with stuff but still, it's a cool glitch! Like once, i was checking my mail to see if i needed to trash any postcards(i only trash penguin postcards, not the clubpenguin team ones) and i was waiting for a postcard to load so it looked like white paper with a big X on it. i decided to trash it, to see who it was from and it said 'Are you sure you want to trash this from the undefined?' it was cool! u should try to check it out! how do u press the tab button so fast?